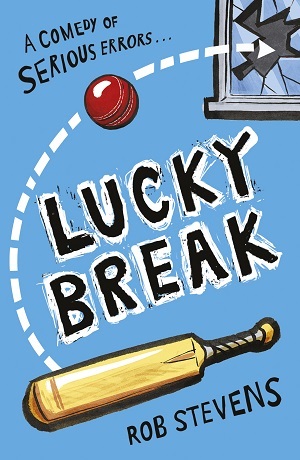 I picked up Lucky Break by Rob Stevens whilst attending an event with Andersen Press, and my little testers loved it so much they said I must feature it. Leon is grieving for his twin brother, who died in a car accident. Since that fateful day, his mother has been ridiculously over-protective of him, and his family seem to have somewhat fragmented. When a new boy, Arnold, pitches up at school, Leon and he strike up a friendship. But Arnold isn’t like anyone Leon’s met before. He’s honest, takes everything completely literally, and yet manages to get to the heart of everything and everyone. Over the course of one weekend, Arnold and Leon get into madcap capers and scrapes, playing sports and taking part in adventures that his mother would shudder at: busting the configuration of the slot machines and running away with their winnings, breaking windows, mistakenly robbing a bank, and yet they come out trumps in the end – Arnold helping Leon and his family to come to terms with their grief, and Leon helping Arnold finally make a friend. It’s a bittersweet comedy, written with pathos and insight, and in a smooth, easily readable style. My new novel, Lucky Break, published this month but writing isn’t my full-time job. I am a British Airways Captain, flying the A380 all over the world. Here are the five best things about being a pilot. The A380 is a double-decker superjumbo – the largest passenger plane in the world. Being at the controls of an aircraft like that is simply a boyhood dream come true! After a long flight I usually get about 48 hours off to relax and unwind before flying home. This is the perfect opportunity for me to forget about the rules and regulations of flying a passenger jet and let my imagination go free. Most of my books are written in hotel rooms and cafes around the world and I find writing the perfect counterbalance to life in the cockpit. No two days at work are ever the same for me. Whether I’m avoiding thunderstorms over the equator or coping with heavy snow in Washington, I never quite know what the day ahead has in store. I meet all sorts of interesting people in my job – passengers and crew. I get a lot of ideas for characters in my books from the people I meet at work. Often a single expression or a turn of phrase can be the catalyst for a whole new book. I love all sorts of active sports and my job allows me to pursue them in some of the most exotic locations. Just this year I have been skiing in California, kitesurfing in Indonesia and walking the Dragon’s Back in Hong Kong. No wonder my sons say I don’t go to work, I go on holiday! Thanks to Rob Stevens. I highly recommend his book, for ages 9+ years, which published on 3rd May and is available to buy here.